The Retirement Café: Are Social Security Benefits a Bond? Jack Bogle has suggested in the past that Social Security benefits are like a bond and should be treated as such in his “age in bonds’ allocation strategy. His reasoning is, I believe, that having that safe stream of income allows you to take more risk by buying more stocks with the rest of your investments, and it does. Whether or not you should buy more stocks, of course, depends on your risk capacity, risk tolerance and current wealth and spending, and not simply on your age. Just because you can buy more stocks doesn't mean that you should. I also agree that a retirement income plan should consider all of a household’s assets, including Social Security benefits. I draw a line, however, at including the present value of Social Security benefits into the bond portion of an upside portfolio to calculate my asset allocation. That’s why I recommended considering Social Security benefits as a component of the floor portfolio in Three Portfolios and calculating the asset allocation of the risky portfolio separately. There are several ways in which Social Security benefits are not like a bond, and therein lies the problem. First, we can't buy or sell Social Security benefits. If we include them in our asset allocation, we can't rebalance that allocation. Second, for most American households, the present value of Social Security benefits is the largest component of the household's wealth, followed by home equity and then retirement savings. Treating the present value of Social Security as a bond would force most households to invest their entire savings in stocks and still not be able to achieve a reasonable asset allocation. Third, and perhaps most importantly, few retirees will value the present value of Social Security benefits as highly as they value an equal amount of stocks and actual bonds at the margin. They might (should) like the benefits better for a large portion of their wealth, but be unwilling to convert all of their stocks and bonds to illiquid Social Security benefits. Retirees have expressed this preference by refusing to annuitize all of their retirement savings. It's a nearly identical scenario, given that Social Security benefits are an annuity. It stands to reason that they would be equally reluctant to back into an all-annuity position by risking the loss of much of their liquid portfolio. Stocks and real bonds can be converted to cash to meet emergencies, to spend more in some years than others, or to take advantage of investment opportunities. If you need more money from Social Security benefits, all you can do is wait. Consequently, retirees with most of their wealth in the present value of Social Security benefits should be inclined to take less risk with their relatively small portfolio of stocks and bonds, certainly less risk than a 100%-stock portfolio would entail. Social Security benefits reduce risk no matter how you treat them in an asset allocation because they reduce spending from a risky portfolio. The probability of a systematic withdrawals portfolio surviving decreases with more spending. Reduce spending from that risky portfolio by spending Social Security benefits, instead, and you can significantly extend the life of your savings. In fact, reducing spending is usually a more effective way of reducing risk than is adding bonds to your portfolio. As William Bengen's chart below shows (focus on the 30-year line), unless you currently hold more than 70% stocks, adding more bonds doesn't change the SWR rate much. (If the sustainable withdrawal rate decreases, it is because SOR risk has increased, and vice versa, so a falling curve indicates more risk.) Adding bonds below a 30% stock allocation actually worsens risk. Treating benefits as a bond in the asset allocation requires the purchase of more equities to obtain a desired asset allocation and thereby increases risk. 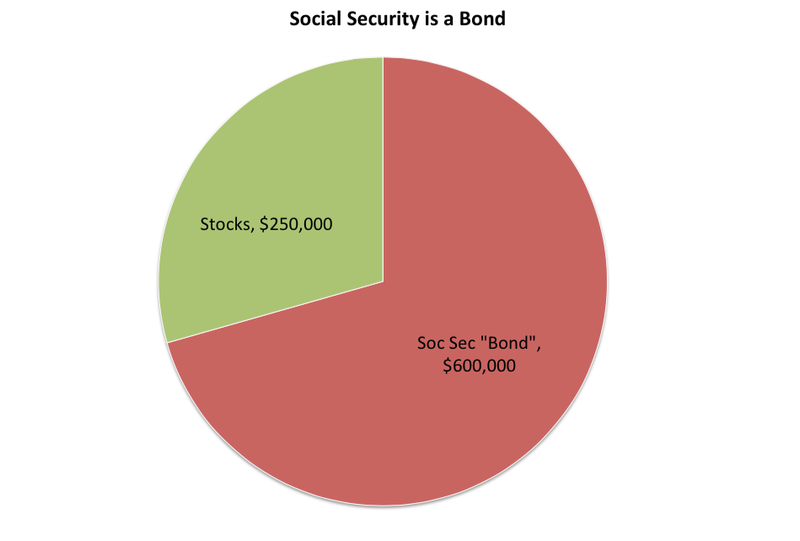 Here is an example of the two alternatives, considering the present value of Social Security benefits as a bond in the asset allocation as shown in the top chart below, and omitting them from that calculation in the bottom chart. Assume a household has $250,000 saved in a 401(k). They expect $30,000 a year from Social Security benefits and can buy a similar life annuity today from an insurance company for $600,000. The household might consider their Social Security benefits, then, to be a bond worth $600,000. Let’s further assume that the household would prefer a 50% bond portfolio because they wouldn’t be comfortable with more than a 20% loss of their savings ($50,000) in a bear market crash. The riskiest portfolio allocation this family can implement for their savings, when considering their benefits a bond, is obtained by investing all $250,000 in stocks. Doing so would still only create a 29% equity portfolio ($250,000 / $850,000), but a 100%-stock upside portfolio. They would have lost over 50% of their cash and bond value ($125,000) in the 2007-2009 market crash and 100% equities is well beyond what Bengen found to be optimal for systematic withdrawals. Had they ignored Social Security benefits for asset allocation purposes, alternatively, they would hold $125,000 in stocks, $125,000 in bonds and would have lost about 20% of that, or $50,000, in 2007-2009. How would income be affected in these two scenarios? In both scenarios, the retiree could spend $30,000 a year from Social Security benefits. 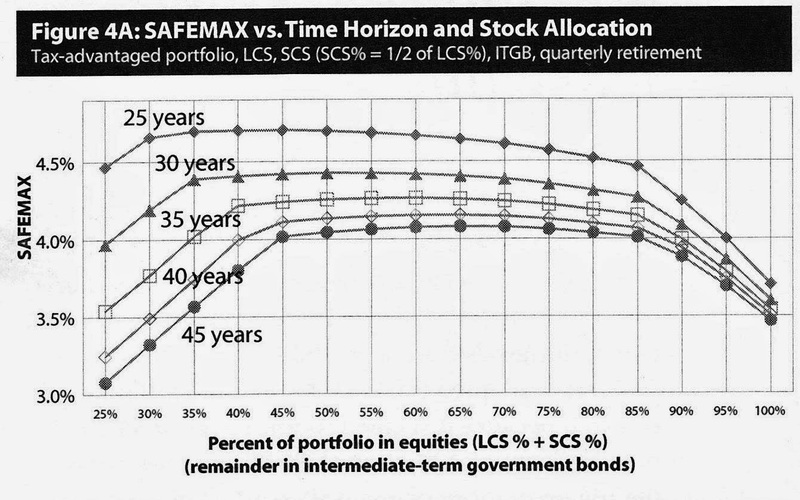 In the Social Security bond scenario of the upper chart, again according to Bengen, the systematic withdrawal rate for a 100% equity portfolio would be about 3.6% of $250,000, or $9,000. That would support total annual spending of just $39,000 a year. 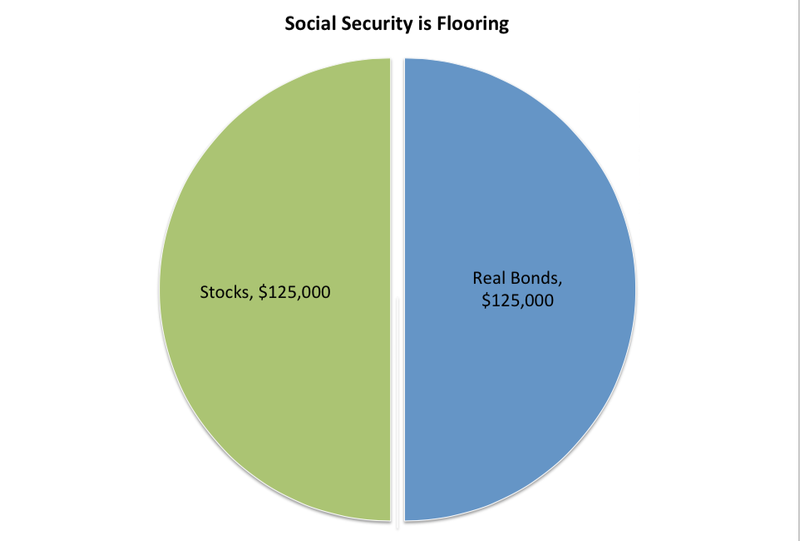 In the scenario without a "Social Security bond", represented by the bottom pie chart, he could spend a systematic amount from the risky portfolio of about 4.4%, according to Bengen, with a 50% equity allocation of the spending portfolio, or $11,000, for total spending of $41,000 annually. If your are so fortunate that the present value of your Social Security benefits is a small portion of your household wealth, which is to say you are quite wealthy, treating Social Security benefits as a bond in the asset allocation will make little difference. But most American households aren't wealthy. I recommend that you calculate your asset allocation both ways. If you’re comfortable with the equity allocation this forces on your upside portfolio, then consider Social Security benefits a bond for asset allocation purposes. If doing so would leave you with an unacceptably high equity allocation inside your upside portfolio, then consider the benefits part of your floor portfolio and manage the upside portfolio separately. I don’t see an advantage to the Bogle suggestion. It increases risk by increasing your equity allocation. Benefits reduce SOR risk by decreasing spending from your risk portfolio no matter how you consider them in your asset allocation. The present value of your benefits can’t be rebalanced and doesn’t have the liquidity of stocks and real bonds. Total spending is decreased when you consider Social Security benefits a bond because the SWR component of income is reduced by the excessive equity allocation of the spending portfolio, from 4.4% to 3.6% of the upside portfolio in this example. Placing the benefits in your floor portfolio and ignoring them when calculating your risky portfolio’s equity allocation, as I suggested in Three Portfolios, provides a lot more control of your savings portfolio and, in most cases, exposes you to less risk with more spending. So, in this case I suggest you take the easy route. Consider your Social Security benefits a safe source of income and address your spending needs net of those benefits separately. P.S. 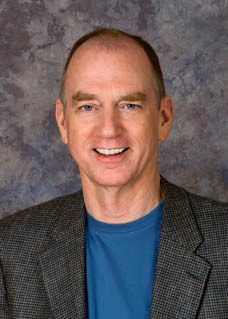 The Yin and Yang of Retirement Income Philosophies, new from Wade Pfau's blog is great stuff! Michael's point (I know this because I spoke with him) is that Social Security benefits would be considered Social Capital on the household balance sheet by many planners and the question of their PV in the upside portfolio's asset allocation would never have been raised in the first place. I avoided this level of complexity in the last two posts because I was trying to simplify the explanation of what should be included in the upside portfolio asset allocation. The more detailed model would add three portfolios above my three. There would be portfolios of Financial Capital, Human Capital and Social Capital, although the HC portfolio is largely depleted for retirees. Whether they are included in a separate Social Capital portfolio or as part of the floor portfolio, they don't figure into the upside portfolio allocation. We agreed that this topic warrants its own post and Michael has agreed to write it as a guest post on my blog. Thanks for writing, Michael! Looking forward to your post. Jack Bogle is also one of my investment heroes. In fact he is at the top of the pile for having done more to improve the lot of investors than any other single person. And Vanguard, the only true mutually owned mutual fund, is his lasting achievement, not only for its historic invention of the index fund, but for its leadership and ongoing influence towards lower invest fees throughout the industry. That said, I never took his comment about social security as literally as he stated it. I thought it was just a convenient way for him to wobble on his long espoused "your age in bonds" dictum without appearing to be doing so. Your post serves to point out the fallacies of his new suggestion if it were taken literally. What I assume he really meant is that the new reality of very low nominal and real interest rates is likely to persist, meaning we can't expect the next 30 years to provide the same high interest rates and capital gains that bond funds delivered for the previous 30 years. I also assume his wobble is a reflection of his implicit acknowledgment that his "your age in bonds" has always failed to consider other non-investment assets such as social security, pensions, and annuities that should, in some manner, be reflected in one's stock/bond allocation. Taken all together, I think he was finding a way to say, " It might not be unreasonable to bump up a little bit your exposure to stocks if you have other sources of non-investment income." Barry, I agree with your every point. Having said that, I will add two points. First, the purpose of this post was to expand upon the Three Portfolios post to answer the question raised by a recent commenter. He was confused by the use of asset allocations and wondered if things like Social Security benefits and home equity should be included. I have argued that I don't think they should be and I hope these two posts have given him and others some perspective. Second, there are very knowledgable people in this field, people I greatly respect, who believe that the PV of Social Security benefits should be considered in the asset allocation. Jack Bogle is simply the most famous to have suggested this. Whether or not he actually believes this or misspoke, some very bright people argue the point. This wasn't meant as a criticism of anyone who doesn't share my philosophy, it is merely an argument of my position. Thanks for writing, Barry! Always a pleasure to hear from you. Besides the excellent information imparted here, I really like the respectful tone of this blog, plus the apparent humility of its author. The comments are thoughtful and interesting, unlike most other blogs concerning financial matters. Thanks so much for your kind post! If trying to figure out how to work for 40 years to pay for perhaps 70 years doesn't keep you humble, not sure what would!